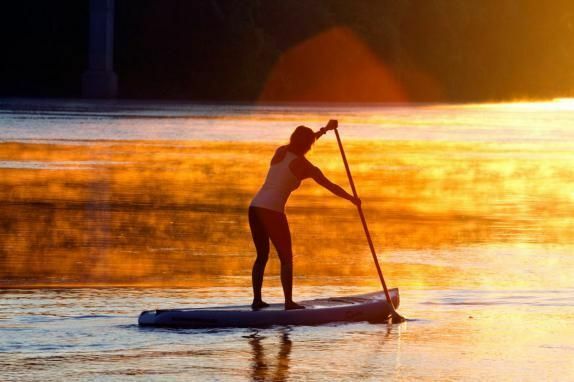 Learning paddle board and kayak techniques is an important part of being a beginner kayaker or paddle boarder. Whether you have never been on a kayak/paddleboard before or you are looking to improve your paddling skills, there are a few techniques that every paddler should know. Picture the width of your shoulders. That, or a little less, is the amount of space that should separate your hands when hold the shaft.Wherever you hold it, avoid applying a death grip on the shaft. It causes fatigue. Instead, use a relaxed grip. Open your fingers slightly and create a loose handhold. If your hand spacing is too wide: You'll gain power but tire out rapidly because this hand position requires a lot of upper-body strength to pull the paddle through the water. If your hand spacing is too narrow: You risk having no strength in your stroke. In each hand, press the tips of your index finger and thumbs and create an O shape to loosely hold the shaft. This is a favorable, fatigue-fighting grip that reminds you that you actually push the paddle during most forward strokes. One of the blades is vertical (this makes it your "power hand"). Matched blades (blades fixed in a parallel position) are commonly used by beginners. In windy conditions, though, using a "feathered" (angled) blade can cut wind resistance. When you pull a blade out of the water, wind may hit a flat blade and cause it to behave like a wind-catching sail, creating drag. Feathered blades present less surface area to the wind create less drag. The forward stroke, paddling's most fundamental motion, involves more than arm power. A well-executed forward stroke is a collaborative effort that combines upper arms and core muscles (back, abdomen and glutes). Intertwining these muscle groups allows you to efficiently propel your boat while minimizing arm and shoulder fatigue. Tip: Think of the forward stroke as putting your blade in the water and moving past it rather than pulling a paddle's blade through the water. This allows greater paddling efficiency. Phase 1 (catch): Wind your torso into the stroke. Dip your paddle on one side of the boat and "catch" a blade's worth of water. (Note: Sometimes the "catch" is considered part of the second, "unwinding" phase.) If placing the blade on the boat's right side, the right side of your rib cage should be angled toward the bow (front). Tip: The best place to dip your paddle is in an area roughly parallel to your feet. Phase 2 (propulsion): Unwind, or rotate, your torso as the blade pushes the water behind you. Use core muscles to push past the blade rather than pulling the blade through the water with your arms. This boosts efficiency and reduces fatigue. Phase 3 (recovery): As the paddle pops out of the water, you're now wound up for the next stroke, with the opposite side of your rib cage angled toward the boat's bow. Overall, the forward stroke is a continuous, simultaneous push-and-pull motion—a push with the upper hand, a pull with the lower, all resulting in smooth torso rotation. Think of your hands as extensions of your body. Imagine throwing a punch with one hand. Gripping the paddle, position one hand about shoulder height. From your shoulder, throw an imaginary punch for an extra burst of power. Add aggressive torso rotation for an extra power boost. In paddling, good technique is more beneficial overall than sheer upper body strength. What's the simplest way to turn a moving boat? Just drop a blade into the water on either side of the boat. The boat will immediately turn in that direction—but you will lose much of your velocity as you turn. To turn while sustaining forward momentum, use the sweep stroke. Phase 1: Lean the boat toward one edge while maintaining a comfortable balance. Extend your arms forward and dip in the blade near your feet to begin your sweep. Phase 2: Sweep the blade in a wide arc toward the rear of the boat (the stern). The most effective part of this stroke is the rear 20° to 30°. Put some power into your body's rotation to optimize the stroke. Phase 3: Finish the stroke by lifting the paddle after it comes near or touches the stern. The result should be a nice, gradual, arcing turn with little loss of momentum. As drivers, we're accustomed to cars on pavement that turn from the front. In the water, however, keep in mind that boats turn from the back. Draw strokes are used to move your boat sideways so you can pull close to a dock or another boat. Use your arms to extend the paddle away from you. Place a blade in the water about 2 feet or so from you; the shaft should be on a slight angle with the lower blade tilted away from you. Use your lower hand to pull the blade straight toward you. To repeat, twist the blade 90° so the blade can slice through the water away from the boat. The slicing motion is also known as feathering. If the blade begins to get sucked beneath your boat, resist the urge to apply a prying motion. You could cause your boat to tip. So simply let go and start over. Keep this little rhyme in mind: Don't pry; better to retry. Sculling is a more powerful and effective draw stroke that requires a little more technique. The motion is like using your blade to spread peanut butter on bread. Extend the paddle away from you. Place a blade in the water about 2 feet away; keep the shaft as vertical as possible. Rotate your wrists so the blade face repeatedly opens and closes as it moves across the water. Maintain a "climbing angle" with the shaft by pushing gently toward the bow when the face is open, toward the bow when it is closed. Drop a blade in the water on one side of the boat then the other to slow your momentum. Begin to back-paddle as needed. This is simply a reverse of the forward stroke. Remember to rotate your torso while you back-paddle. More than any other factor, wind influences kayaks. Anything over 10 knots (11+ miles per hour) begins to affect a kayak. (Water current can also impact a boat.) When sitting on water, your body or any part of your boat can capture wind and act as a sail. This will impact your speed and direction of travel. A direct headwind is the toughest for a paddler to overcome. More often a kayaker is faced with what is known as a quartering wind, where wind hits you on an angle. If your goal is to paddle straight toward an object and wind blows against you at an angle, your boat will act like a weather vane. For example, if you want to paddle toward noon, and the wind is coming from 2 o'clock, the back end of your boat will want to conform to the wind and fall in line with it, just like a weather vane. Thus the front end of the boat will head right into wind. How do you correct that? Counteract with corrective paddle strokes, such as a sweep stroke on the opposite side of your boat. When you’re new to the sport, it’s best to start out in flat, calm water that’s free of obstacles like boats and buoys. Standing alongside the board in shallow water, place your paddle across the deck of the board and use it as an outrigger. The paddle grip is on the rail (edge) of the board; the blade rests on the water. Climb onto the board in a kneeling position, just behind the center point of the board. Once you’re ready, stand up on the board one foot at a time. Place your feet where your knees were. You might also bring a friend to help stabilize the board as you get the hang of standing on it. Your feet should be parallel, about hip-width distance apart, centered between the board rails (edges). Don’t stand on the rails. Much like bicycling, when your forward momentum increases, your stability increases as well. Once you’re comfortable balancing on the board in flat water, it's time to take off on a longer excursion—where the real fun begins. The elbow (angle) of the paddle faces away from you. This may look and feel counterintuitive at first. Keep your arms straight and twist from your torso as you paddle. Think of using your torso to paddle rather than your arms. You have more strength in your abdominal muscles than in your arms. At first, keep your strokes fairly short and close alongside the board. No need to overpower it. Sidestroke: One way is to simply paddle on one side until the nose turns in the direction you want to go. Want to turn right? Paddle on the left. Headed to the left? Paddle on the right. This will make a long arcing turn. Backpaddle: A faster way to turn or reverse direction is to simply drag the paddle or paddle backwards on either side of the board. Sweep stroke: Plant your paddle towards the front of the board and take a long sweeping stroke away from the board and towards the tail. Your board will turn to the opposite side of the stroke. Another turn that works well, especially in surf, is to paddle on your dominant side (i.e., if you’re right-handed, put your left foot forward and paddle on your right side). Really bend your knees and put more weight on your back foot. This allows the board to pivot and turn quickly.